Yechury said the CPI(M) would decide its strategy depending on the outcomes of upcoming assembly polls in five states. 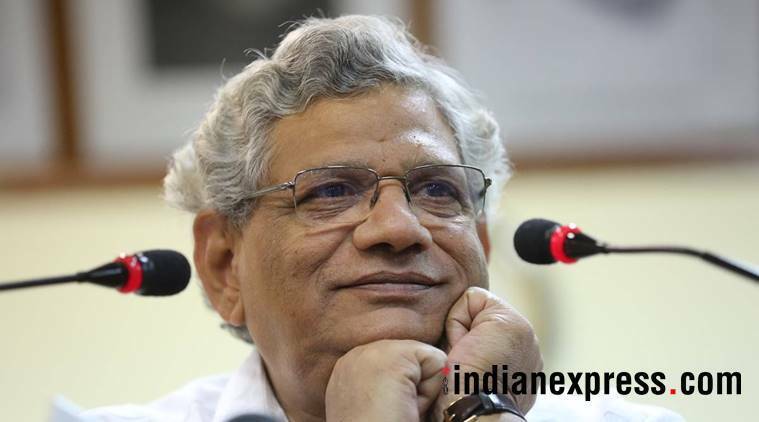 CPI(M) general secretary Sitaram Yechury said Saturday it was “too early” for the Left party to finalise its strategy for the 2019 Lok Sabha election but stressed it would give a call to unseat the ruling BJP. An all-India alliance with opposition parties might not be possible so the CPI(M) would go for state-wise understandings, he said. “It’s too early to decide our tactics for the Lok Sabha election. But we will call for the defeat of BJP and its allies in the upcoming election … We are also aiming to establish an alternative secular government at the Centre,” Yechury told reporters in Kolkata. “For the general election, our objective will be to increase the strength of CPI(M) and the Left in Parliament. Our objective will be to help maximise pulling off anti-BJP votes,” he said. Asked whether the Left party would participate in a mega political rally planned by the Trinamool Congress in Kolkata in January next year, he said the CPI(M) was yet to receive invitation for it. He said 10 central trade unions have decided to go on a two-day nation-wide general strike from January 8 to protest the “anti-worker policies” of the central government.